AL-JULAIA: Nostalgic for their Bedouin roots, Kuwaitis like Ahmad Al-Shimmari are following in the footsteps of their desert-dwelling ancestors living in tents under the stars-but with a touch of modern luxury. The former oil sector employee and 15 other men, all relatives and friends, are sharing one of six tents in a camp set up by his extended family for the entire winter close to the border with Saudi Arabia. “This camp will remain pitched here for five months,” the 49-year old said as he sipped black tea boiled on burning charcoal. Others were watching football on a large flat-screen television connected to two satellite dishes or discussing the latest events in the oil-rich emirate. Shimmari’s camp is just one of many set up in Al-Julaia, around 70 kilometres (45 miles) from the capital Kuwait City, on both sides of a narrow paved road leading deep into the desert. The area has its own police station, a small clinic and a fire department office. Al-Julaia bustles with life on weekends, holidays and school breaks as young quad bikers kick up clouds of dust racing in the sands. The 15-square-kilometre (six-square-mile) camp is one of more than 20 such sites allocated for desert camping by the Gulf state’s government. 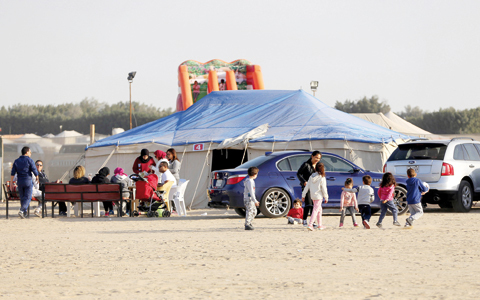 Tens of thousands of Kuwaitis and foreigners flock to the desert during the annual camping season from November to the end of March, mostly rain-free months, before the scorching summer heat sets in. “Four of the tents in the camp are for sleeping and two big ones are used as living rooms, one for men and the other for women,” said Shimmari. The tent in which he and the others are sleeping spans five by 10 meters (15 by 30 feet). Some families stay for days and even weeks at the camps, especially when there is a school break, while employees commute to their offices each morning. “Here you can live like at home,” said Shimmari’s elder brother Mohamed, seated on a colorful, traditional bedouin woven mattress. Camps also have running water supplied by tankers, toilets, showers and fully-equipped kitchens. The tents can come with modern beds, while some campers prefer to use mattresses on the floor or to sleep on carpets. “We have a strong affection for the desert because a majority of Kuwaitis are Bedouins. We remember the past,” the elder Shimmari said, harking back to the pre-oil discovery days. Many ministries, government departments, state oil companies and private firms set up desert camps for their staff for the entire five-month duration. “Desert camping has become a great experience for our children and families who come in large numbers to escape from small homes,” said 71-year-old Abdulmajeed Al-Jareeri at one of the company camps. It is also big business for local companies which supply tents and other facilities for individuals to rent and set up camp. “There are various classes of camps, starting from ordinary to luxury ones for VIP and VVIP (very, very important person) standards,” said Mohammad Al-Qaryouti, who runs a desert camping store. He said some camps can cost over KD 100 ($330) a day, more than a five-star hotel room.